Beck is an American born Musician, record producer, multi-instrumentalist, rapper, singer and songwriter whose style is highly experimental and lo-fi in delivery. He came into popularity in the 90s after his plethora of creative collages which spanned diverse genres of music. Nonetheless, he was still largely unknown to a wider range of music lovers usually in the pop dominated industry. This fact came to light most especially in 2015 after Beck’s two Grammy awards win came as a surprise to many who felt other well-known artists were deserving of the awards he received. No doubt, if he hadn’t been widely known prior to the Grammys, one thing is for sure, the whole controversy launched him further into fame and popularity. Just in case you fall into the category of persons who aren’t so familiar with the star, read on for more interesting facts. Beck David Campbell who goes by the simple stage name of “Beck” was born in Los Angeles, California, on the 8th of July 1970 into a very creative family. His mother, Bibbe Hansen used to be an actress, his father, David Campbell used to be a string and arranger and a music conductor while his maternal grandfather, Alfred Earl “Al” Hansen was a key Fluxus artist. When he was in the 10th grade, Beck dropped out of school in the early 90s after which he became a street busker. He played folk music and acoustic blues in the local coffee shops close to his home. From time to time he tried his hands on poetry slams as well. In 1992, he released the single titled MTV Makes Me Want To Smoke Crack after he was discovered by Bong Load Custom Record(an independent record label). Now he has 12 studio albums to his name including; Golden Feelings, Mellow Gold, Odelay, Morning Phase, among others. In the entertainment scene, there seems to be a rise in the number of stars who do not practice the more mainstream religion like Christianity. One of such religious groups that seem to be gaining more grounds among a good number of celebrities in Hollywood is the religion of Scientology and Beck is a practitioner. Other notable celebrities who act as poster figures for the religion include; Tom Cruise, Kirstie Alley, and John Travolta. According to Beck, his father, practiced the religion for over 35 years thus exposing him to it. 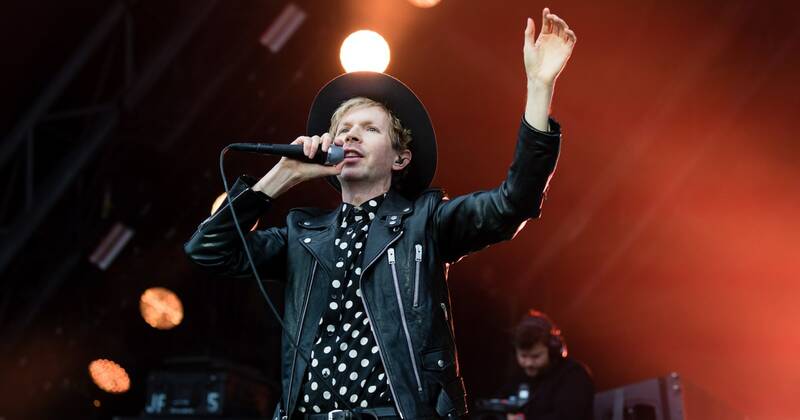 Beck has further lauded the humanitarian works of the church of Scientology. Beck is out of the dating game and he has been so for a while now. He is a married man and one who is happy in his union with his wife Marissa Ribisi. Interestingly, his wife Marissa happens to be the twin sister of famous actor Giovanni Ribisi, who is most famous for movies such as; True Crime, Dazed and Confused, Pleasantville and The Brady Bunch Movie. Social media platforms experienced a frenzy in 2015, this time caused by an already known trouble maker in the entertainment industry Kanye West. This happened during the 57th GRAMMY Awards night when Beck won the “Album of the Year Award” over the favorite, Beyoncé. During his acceptance speech, Kanye walked over to the podium in an attempt to sabotage his speech just like he did that of Taylor Swift back at the same event in 2009. Though Kanye just walked over then back to his seat during Beck’s speech, he later shared his displeasure after the close of the event stating that awards should always go to the deserving artist and that Beck didn’t deserve the award. After the awkward and quite embarrassing behavior of Kanye West, many would have expected Beck’s reaction to be quite hostile, however, his reply and handling of the situation was nothing short of graceful. He said that Kanye was privy to his opinion and that he respects him as a true artist who he admires given the body of work the rapper has been able to put out over the course of his career. Beck is truly a gifted artist and deserves every bit of the accolades he enjoys especially in recent times. For those who are unaware, of his artistry, he started his career early in the 90s where his experimental style of music brought him to the attention of many especially the label that signed him. Moreso, his craft becomes well grounded with his skills and ability to play more than twelve different musical instruments including drums, sitar, glockenspiel, banjo, and the guitar.